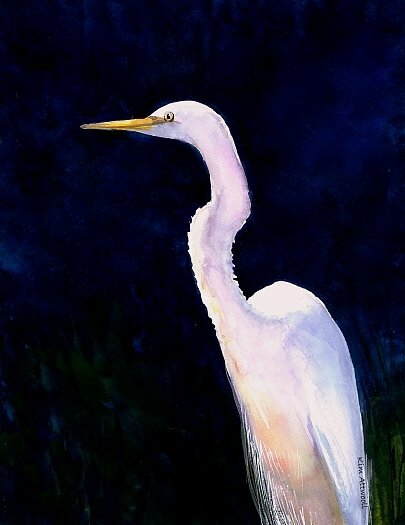 I'm drawn to painting pictures of birds. The variety is endless and the colors and shapes are numerous. Capturing the essence of the many different types of birds is great fun for me. Lately, I've found that enhancing some of the birds involves cutting away the background from around their heads. It's effective to embellish the hummingbird's wings with sparkles to suggest their speed. Many stores buy the bird images so I guess the appeal of these winged creatures is universal. This rooster symbolizes a few things. 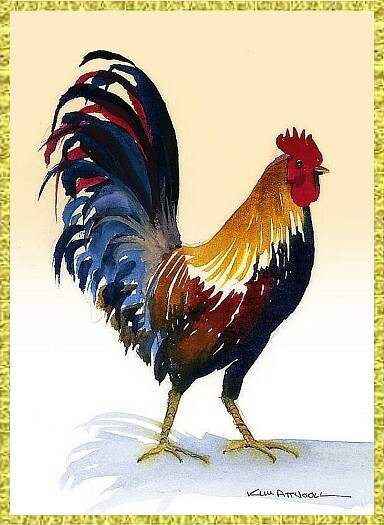 Some people just love the country icon and collect pictures of roosters to adorn their kitchens or dining rooms. I like giving it for a Father's Day card. For someone who has achieved a milestone, you can write, "Congratulations, You Have Something to Crow About". This sunlit white egret would loose some of his drama if I'd placed him on a lighter background. Instead, I chose to surround him with indigo (a very dark blue) and I'm delighted with the result. I like to enhance him subtly with a sparkle on his eye and just a few feathers highlighted. Don't you agree he is one of many pictures of birds that can be framed?